B series turbo fuel injection. Home > A-Series EFI / Injection > B series turbo fuel injection. As the heading suggests, this isn’t for a mini, but BMC nonetheless. I currently have a 54 MG Magnette under restoration, and whilst she is off the road, I was planning on changing out the single HIF44 for fuel injection. I will post a photo of the current setup, out of interest, however what I am thinking of doing is something much different. I have an old set of 1 3/4 twin SU’s that are missing the fuel bowls and some other parts, that I was planning was to remove the dampers and machine the bottom of each carb to take a pair of injectors from a 1.8l Astra and run it as a batch fire system through a Lynx alloy inlet manifold. 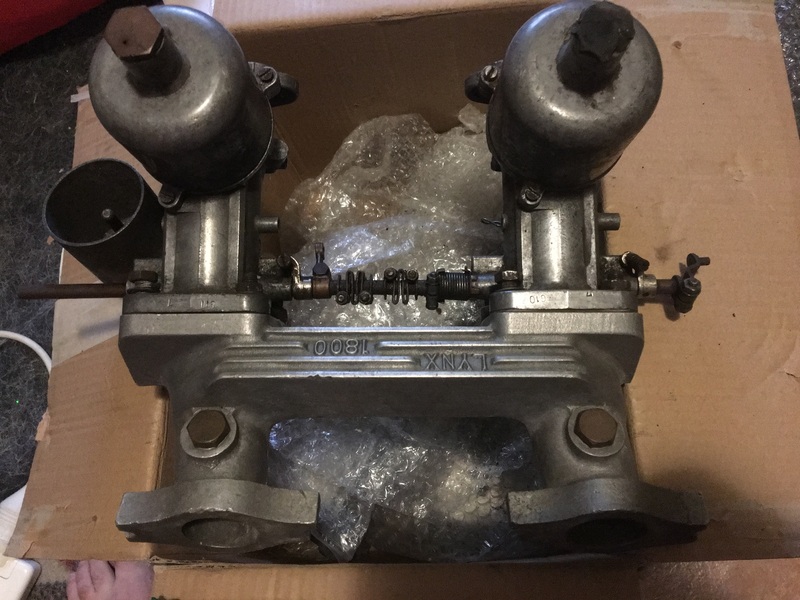 Both the manifold and carbs have long runners which I hope will solve any port robbing issues. I was advised that the position of the injectors before the throttle butterfly might cause me some issues at idle, but I’m confused as to why, given that I intend pointing the injectors in where the old jet used to be. I would love to hear anyone’s ideas on the concept, and what they would suggest as far as Ecu. Would it be possible to use pretty much everything off the Astra or would I be better off doing as everyone seems to do and go aftermarket? Will I need to go with bigger injectors etc? Due to the discrete nature of the injection pulses and the fact that the cylinders are 180/540 degrees apart, using batch fire and a twin throttle body setup is not something I would recommend. The long runners will never replicate a carb behaviour which only provides fuel when air goes through it and therefore avoids the discrete pulses issue. Will it run? Yes and it might even run pretty well. But it will have a significant AFR difference between cylinders and some have measured that at 1.0 AFR or more. And it will likely not be consistent under different running conditions. And looking at a single O2 sensor will not give you any indication of the unevenness but will only give you at best an average AFR. If you want to run batch fire, you should look at using a single throttle body that will feed all 4 cylinders. That way the discrete nature of the pulses is mostly evened out. But you still have uneven wall wetting contribution and the geometry of the intake setup that will affect fuel and air distribution. The best EFI setup will be a port injection setup with sequential injection and individual cylinder AFR monitoring (or at least one sensor for the inner cylinders and one for one outer cylinder) so that you can adjust fueling independently for each cylinder. That means the need to be able to tune injector pulse widths and injection timing. There are a few different examples of this sequential injection principle in the EFI section. Ok, thanks Jean. Your input is greatly appreciated. I have absolutely no idea when it comes to these conversions, but I would be really keen to get this running. So reading between the lines, I should abandon the idea of using the donor cars ecu and go aftermarket? Also, when it comes to port injection, are the injectors better to be closest to the cylinder head or back some distance. I will attach a snap of the carbs and manifold to give you an idea of what I am working with. I have only seen O2 sensors under the car, how close can the get to the head without getting too hot?